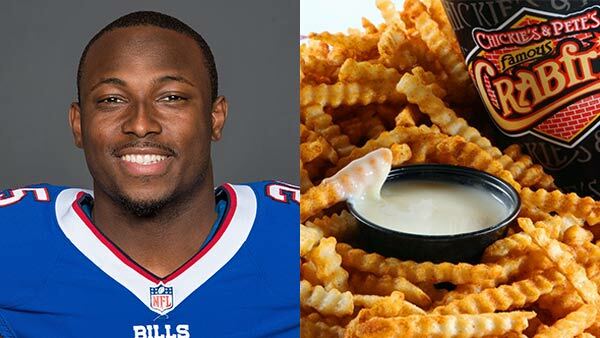 PHILADELPHIA (WPVI) -- LeSean McCoy is back in Philadelphia for Thursday's Eagles game and he wants to show his Buffalo Bills teammates some true delicacies of the City of Brotherly Love. Action News has learned the former Eagles running back has ordered 200 cheesesteaks and crab fries from Chickie's & Pete's! McCoy placed the massive order for the team to enjoy after the game, the restaurant confirmed with Action News. Chickie's and Pete's was very happy to oblige. "When in Philly you have to have a #Cheesesteak and #Crabfries! Thanks @CutonDime25 #chickiesandpetes #phillyproud," the restaurant tweeted. The Pennsylvania-native, who played for the Eagles from 2009 to 2014, tweeted Wednesday that he was back in town and the "the PHI love will always be strong."